The Indian Equity Markets saw rollovers and expiry infused volatility and ended the day with a modest loss of 12.85 points or 0.12%. The benchmark NIFTY50 pared all of its gains in the last 45-minutes of trade and ended near the low point. Though there was volatility in the Markets, it was range bound volatility. The more important fact which is technically important is that the NIFTY has once again slipped below the 10490-mark and the earlier breakout attempt has subsequently failed because of lack of confirmation. Going into trade on Friday, we can still expect the Markets to show a quiet opening and try to move past the 10490 levels again. The levels of 10490 and 10535 will act as resistance while supports come in lower at 10410 and 10350 zones. The Relative Strength Index – RSI on the Daily Chart is 60.5969 and it stays neutral showing no divergence against the price. The Daily MACD still remain bullish while trading above its signal line. A black body has emerged on the Candles but it remains insignificant in the present formation. The pattern analysis shows that the previous attempt of the NIFTY to break above the 10490-mark has failed given the lack of confirmation. 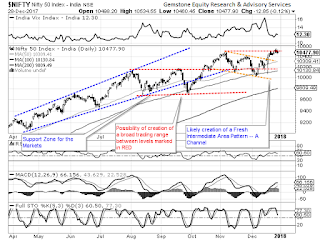 Now, it would require to break out above this level afresh and until this happens, the zones of 10490-10535 has become a formidable resistance for the NIFTY. Overall, if we discount the Thursday’s volatility to be expiry-driven, it would be necessary to see that the NIFTY makes fresh attempts to move past 10490-mark. 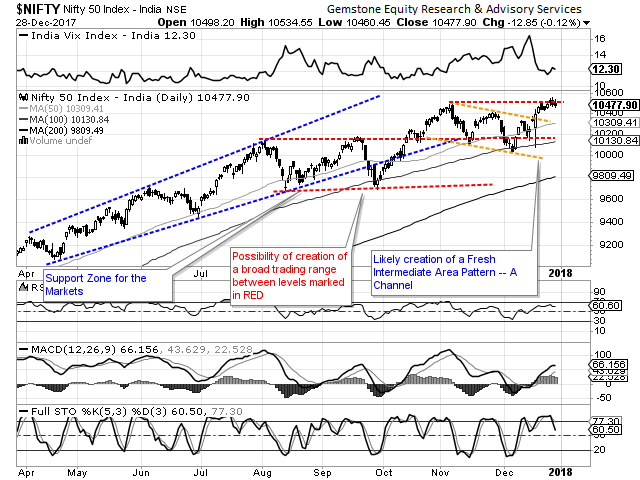 No sustainable up move shall occur until the NIFTY moves past this critical resistance zone. We reiterate our cautious view on the Markets until this occurs. Stock specific out-performance will occur. Highly stock specific and cautious view is advised for the day.